Two different worlds come together in a genius fusion of the warm grooves that have become the trademark of Djuma Soundsystem and the LazarusMan’s quick and heartfelt poetry slam. Merging the backgrounds of urban Johannesburg and north most Norway these two create something unique every time they enter the stage, an outlet bringing the energy from poetry slam and electronic music together. Spoken word artist The LazarusMan touches current affairs and day to day motions of life with humour, the contrast of Djuma’s background from a sheltered upbringing provides a breeding ground for an intense blend of multi layered cultural experiences. After having successfully worked on a track together a further collaboration between the two felt natural. Whereas Djuma has been a household name on the international scene for the last decade, LazarusMan have been operating back room theatres and the streets of South Africa. 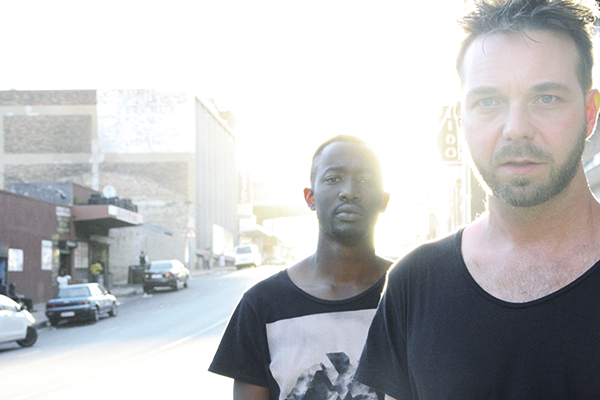 Their diversity has got them playing gigs at upbeat clubs as well as in townships. Djuma Soundsystem has an impressive list of collaborations with artists and releases and behind him – ’ Les Djinns ‘ undoubtedly being his greatest success remixed by Trentemøller, and for labels like Rebirth, Get Physical and Noir. The LazarusMan have become increasingly in demand on the house scene after several collaborations with Aki Bergen, Soul Clap and Stimming only to name a few. Already having toured South Africa together with great audience response, they now have two new tracks coming up and a tour planned for June-July. The track ‘ Love Her Madly’, telling an intense story with its deep beats, is an excellent taster of how good of a match this combination makes. The LazarusMan is the words, and Djuma Soundsystem is the music. This entry was posted in Featured and tagged Djuma Soundsystem, Lazarusman, love her madly. Bookmark the permalink.